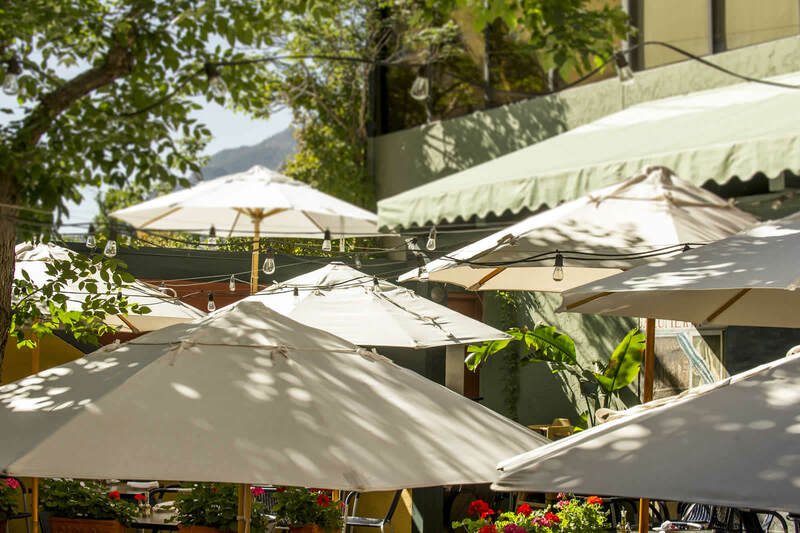 With the return of sunny afternoons and warm spring temperatures, the restaurant patio is an increasingly inviting venue. Among the hidden gems of the Pearl Street merchant district is just such a perfect dining patio. The Mediterranean Restaurant (“the Med” as it’s locally known) offers an intimate tiered approach to patio dining, squeezed amid multi-story buildings off Walnut and 11th, 1002 Walnut St., themedboulder.com, (303) 444-5335. In the brunch-time sun, beneath an umbrella on the Med’s patio, one is transported to another less harried place (albeit, there is no laundry airing out from the balconies above, as you might find in Greece, Italy, or any of the other countries from which the Med takes its culinary inspiration). True to its advertised tapas and small plate theme, the Med offers a bevy of regional options to fit any patio-lover’s palate, fit to be assembled into a meal or a quick-nosh meet-up. The special and experimental dishes offered by Executive Chef Kelly Kingsford and Chef de Cuisine Corey Cunningham offer a gateway to a true experience. On a recent Sunday, the brunch menu included bright citrusy Escabeche, a tapas of firm fresh lemon-marinated Yellowfin tuna bites on a salad of crisp green jalapeño, avocado, and cilantro, across which was drizzled Calabrina chili oil (a small red, Italian pepper with a mildly fruity aroma and flavor). Shredded cucumber was added to the side to cool down the pepper spices. Due to its freshness and the aromatic mixture of citric acid, peppers, and spicy cilantro, the fish-forward dish carried no off-aroma, and fell light on the tongue. 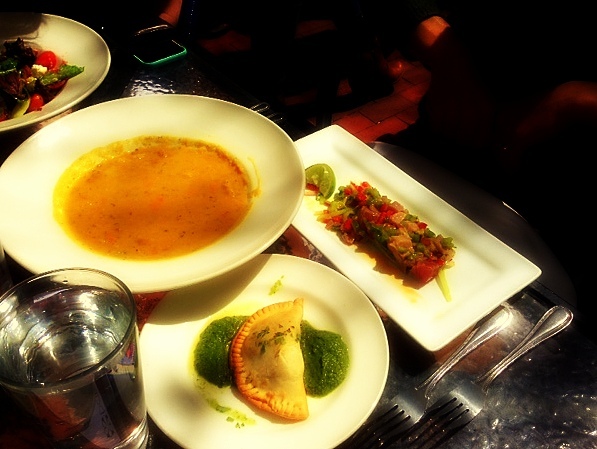 Another item which has now been added to the tapas menu and completes the patio experience is the Chorizo Empanada. Wrapped in wood oven baked pastry, lightly salty bits of chorizo and bacon, meld with the earthy characters of the potatoes and spinach, complemented with creamy hints of Manchego and aromatic Romesco cheeses. The two-bite portion packs an unexpected abundance of flavors that elevate this otherwise common street food item into a feast for the senses. No homage to Greek gastronomy is complete without embracing lamb, and The Med prepares this classic meat with true inspiration. Epitomizing the kitchen’s skills is its Lamb Lentil Soup, a dense composition of puréed lentils and potatoes, supporting moist tender minced lamb without a trace of gaminess. Fenugreek and Oregano seasoning pique the lamb’s character and enhance the lentils in a menagerie of layered flavors. Whether these three items make it onto your patio dining menu or if other options appeal more, the patio at The Med is well worth the visit and before the sun reaches its zenith. Be careful though, the patio can be just cool and inviting enough that you might find yourself sticking around to peruse the dessert and cocktail menus as well. 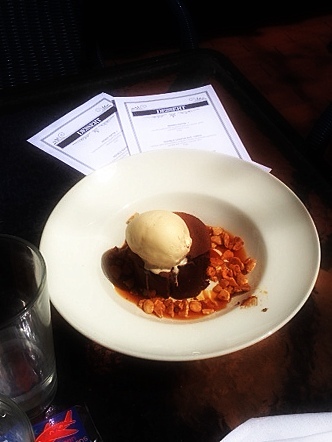 And The Med never lets you down when it comes to either inside or on the patio, especially with the chocolate almond tower- a warm chocolate round blessed with a scope of decadent salted caramel ice cream, caramel sauce, and garnished with candied almonds. As the whisper of summer’s warm breath grows strong, the patio beckons.